Getting a brand spanking new bike is always exciting, but picking up our Yuba Mundo today was more than that. 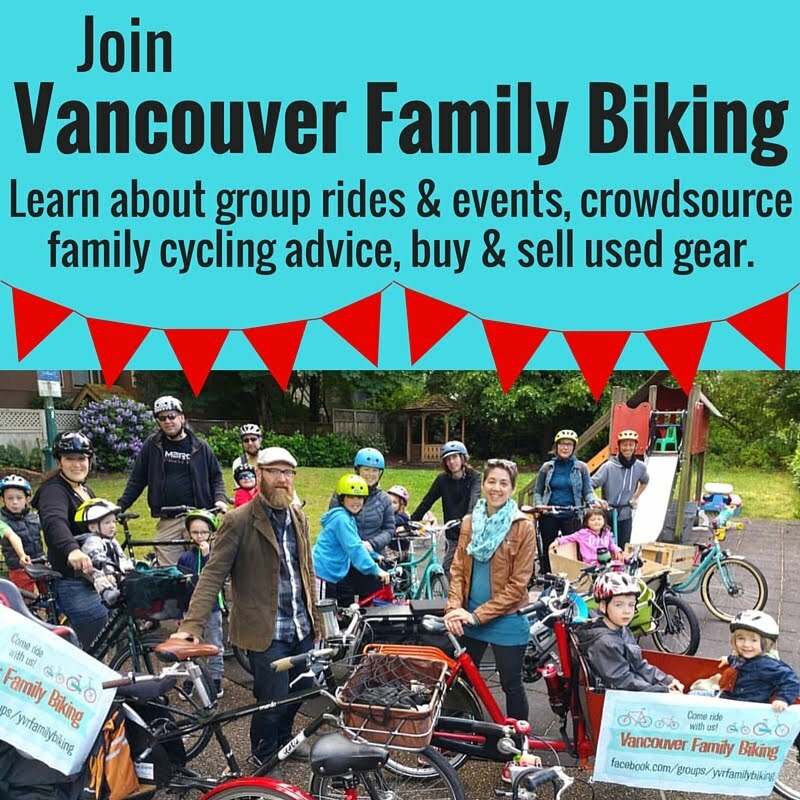 It was the culmination of about two years of hemming & hawing over what kind of bike would work best for our family. We read blog posts, scanned reviews & pored over the family cycling articles in Momentum magazine. We poked around in bike shops, interrogated anyone we saw out in public with a longtail or a bakfiets, & we haunted dutch bike websites. 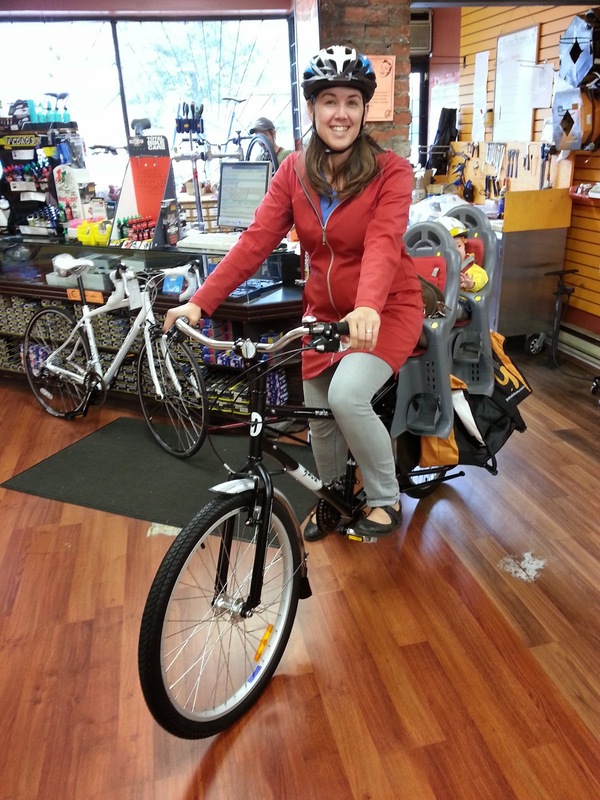 Once we settled on the type of cargo bike, then the brand, then electric or not, we looked for the best deal we could find. These bikes are not cheap: the Yuba retails for $1450 plus about another $1000 for all the accessories. Not very many bike shops sell them, either--two or three in Vancouver that I know of--but happily, one of those shops is The Bike Doctor. I know the shop owner, Paul Bogaert, who I met at a cycling workshop. He gave us a discount on the Yuba & I will be spreading the word on social media about our experiences with the bike & The Bike Doctor. Yesterday we picked up the bike, got the two child seats installed & one of the gigantic panniers, the GoGetter bag. We're waiting for a few other items-- the second GoGetter, a Bread Basket front rack, bamboo running boards, a seat pad, handlebars & foot pegs so that Linnaeus can sit on the rack when he's a bit older, plus a couple cargo straps. We got nearly every single accessory that's available for the Yuba. Not long after we got home I took Linnaeus for a quick grocery shopping trip. Riding the Yuba is so much fun! Because the rear rack is part of the frame, carrying the weight of an almost-four-year-old plus groceries is easy. No wobble, plus the long wheel base smooths out the ride. The granny gear makes uphill climbs a cinch. The best part is that unlike riding a bakfiets or Christiania trike (both with the box in the front) or pulling a trailer or trail-a-bike the Yuba feels like a normal bike. I didn't feel like I needed to get used to anything. It's been nearly 15 years since I bought a new bike, so I'd almost forgotten what it's like. Zipping around on the brand spanking new Yuba was glorious: the brakes are perfectly adjusted, it shifts smoothly (definitely well put together by the staff at The Bike Doctor) & I loved hearing the brip-brip-brip of the new tire nubs as we cornered. Though it looks & functions like a station wagon, this bike doesn't ride like one. Can't wait to tell you more about the Yuba! Stay tuned for more of our adventures on the bike & a little about the history of cargo bikes. If you can't wait for my next post, you can follow us on Instagram, Twitter, or Facebook to see more every day!